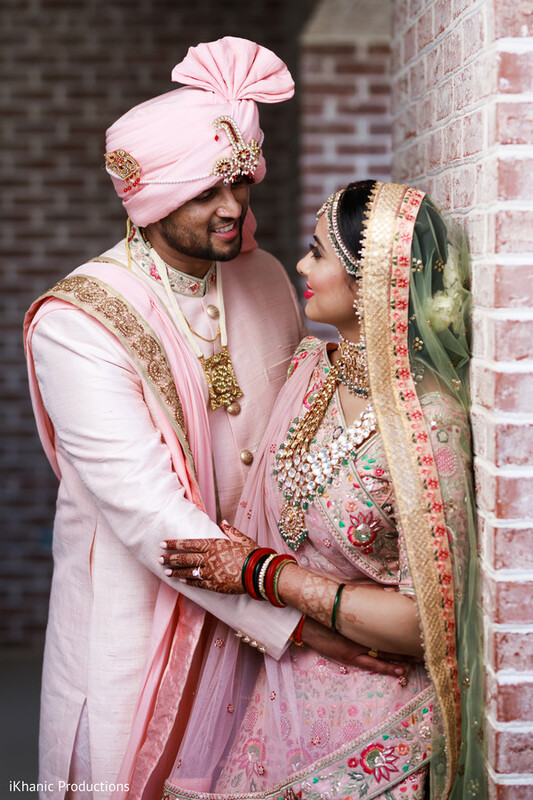 Today's Indian wedding feature blends traditional elements of a love story with a contemporary take on classic romance with Priyanca and Vishal's enchanting Indian wedding. 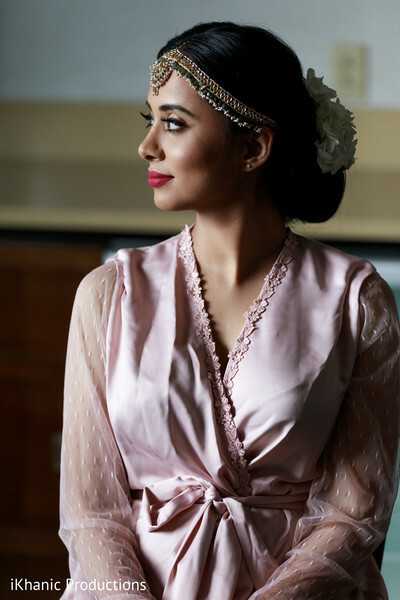 Payal MUA ensured this bride's makeup glam was complimentary to Priyanca's staggering Indian wedding gown. 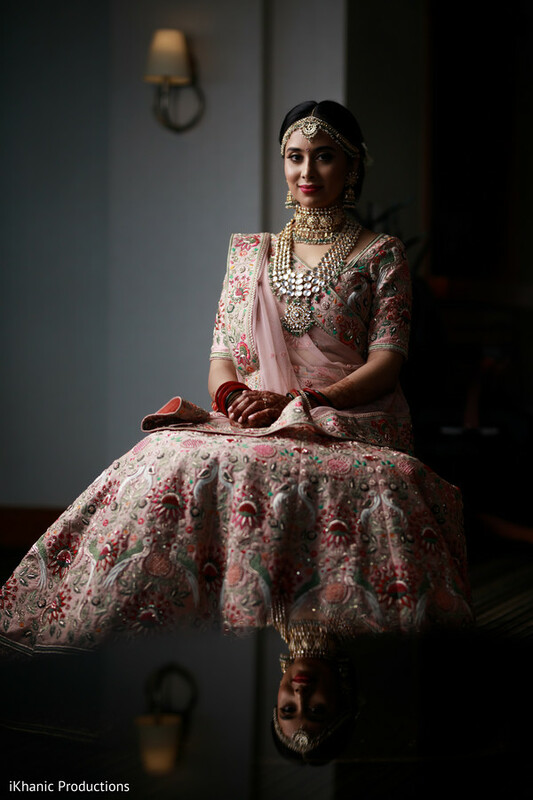 The bride's trousseau had an elegant, subtle fit and flare silhouette that was enhanced with sparkling beading. 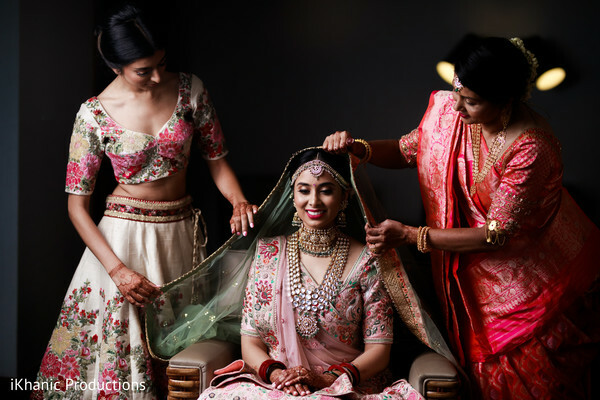 Teamwork is at the center of this splendid event, and this Maharanis, is the secret to planning a fabulously executed series of events! Xquisit Events designed a blueprint that included Amplifier Entertainment and Bollywood Bistro that any Indian wedding guests wouldn’t soon forget. 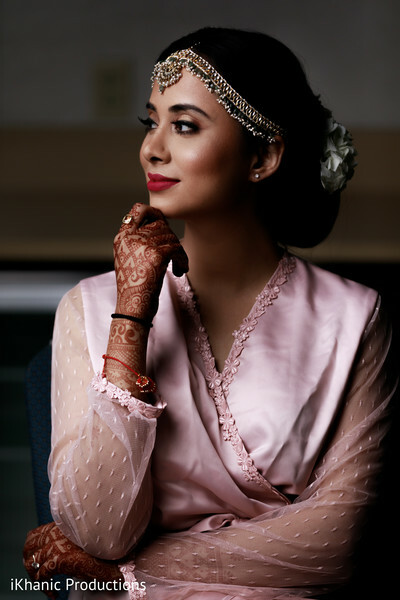 Shot by Northern California based Indian wedding photographer iKhanic Productions, I insist you must meet me in the gallery. Vishal is a lawyer, who is type A and I am a physician but have a creative side. Somehow, this worked out when we both met at a bar in Philadelphia. Vishal recently moved to Philly from Birmingham, Alabama as a pit stop for a few months until moving to Chicago. I, on the other hand, lived in Philadelphia for quite some time for medical school and residency. When I met him, I knew there was something different about him. He was a southern gentleman and was incredibly outgoing. I knew he was the one when he proudly put his arm around my waist while we were on a date at a wine and cheese convention and introduced me to all his friends. I wish I could say that the proposal was a surprise! The proposal happened in Hawaii when both of our families went on a vacation together. There were a lot of hints, such as my mom insisting me buying a nice dress and getting my nails done. The morning of the proposal, I went on a hike with my mom and now sister in law. After the hike, we were scheduled to take family pictures. When I arrived for the pictures, I noticed no one was around except Vishal. He and I walked a bit and he got down on his knee and asked me to marry him! Planning for the wedding began about a year before the wedding. I first researched venues and made a spreadsheet with the venues and what I was looking for in the venue. After deciding on a venue, I started researching other vendors, such as makeup artists, decorators, and DJs, but quickly realized I needed the help of a wedding planner. Once I hired a planner, we discussed vendor options. If you're a really picky bride like me, I did a lot of research on my own to find the best vendors for my style and budget. Additionally, I wanted vendors that could make my vision a reality. The theme I imagined was florals and millennial pink tons for my wedding ceremony and reception. Flowers were a big deal to me so I needed a decorator that could really bring that to life. In terms of DJs, I wanted a group that could do a lot of special touches, such as a LED starlit floor, uplighting, indoor fireworks, and a cloud machine for the reception. Hair and makeup had to be someone who was able to show me they understood my vision. 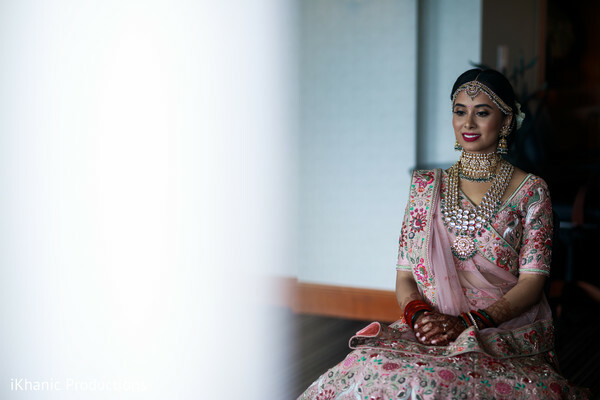 I wanted to go off beat with a pink wedding lengha but I wanted the hair, jewelry, and draping to be on the traditional side (think: Sabyasachi draping). All in all, the look of the entire wedding was classy and very pink. The most enjoyable part of the wedding planning process was the moment I found a perfect vendor. I loved booking vendors that are passionate about what they do and are ready to make wedding day magic happen. My guests loved the outdoor wedding, which has never been done by anyone in my family. Additionally, they loved the food and reception decor. In lieu of having bridesmaids and groomsmen, I had important members of my and my husband's family walk down the aisle. We did not want to force anyone to buy outfits of our choosing so we recommended colors that both wedding parties should wear, which created a really cool, eclectic, but cohesive look. See you in a twinkle! Amplifire Entertainment, Xquisit Events and Bollywood Bistro are members of the Platinum Guide. Love what you see? Explore their portfolios.